Genetically Engineering an Icon: Can Biotech Bring the Chestnut Back to America's Forests? In the 20th century, a blight killed off four billion of these towering trees. Now, new research shows that a gene, taken from wheat, provides resistance. "The forests of America,"John Muir wrote in The Atlantic in 1897, "... must have been a great delight to God; for they were the best he ever planted." Muir didn't know it yet, but by the time he wrote those words, the king of the eastern forests, the American chestnut tree, was already doomed. An interloping fungus had arrived at America's shores two decades earlier, and it would soon make short work of this then-common species. In less than a century's time, it killed off an estimated fourbillion of these towering trees. Now, for the first time since the die-off, there is real hope. Researchers at SUNY's College of Environmental Science and Forestry have been trying to build a better American chestnut, one that would be resistant to the blight, and there's reason to think they've succeeded. Such a plant could repopulate the vast region of the eastern United States in which the tree was once found. It's hard to overstate what a dramatic reversal this would be. Chestnuts were once one of the most abundant trees in the eastern United States, making up about 25 percent of the mature timber. Today, there is a list on Wikipedia entitled "surviving specimens," and it is not long. The trouble began in the 1870s, when Americans began importing chestnuts from Japan to New York. The Japanese trees were shorter, making for a better orchard crop, as their nuts could be more easily reached. Unfortunately, those trees harbored Cryphonectria parasitica, a fungal blight to which they were resistant, but to which the American variety was highly susceptible. The fungus would attack a tree at a wound and then spread beneath its bark, releasing a toxin known as oxalic acid that would poison the tree and reduce it to a mere stump that would occasionally send out shoots, but could never grow tall. The blight was discovered in 1904 in what is now the Bronx Zoo by a scientist named Hermann Merkel. Within five decades of that date, the fungus had spread across the entire range of the American chestnut, from Maine to Mississippi. Since the blight's discovery, countless efforts have been made to control the blight or somehow re-instate the trees. Early on, before it had spread too far, people tried cutting firebreak-like gaps into forests, such as a mile-wide chestnut-free zone etched into Pennsylvania -- but the fungus lived on oaks too (though it did not kill them) and made its way across the divide just the same. In more recent decades, scientists have tried cross-breeding the tree with its Asian counterparts, hoping to create a variety that is as American as possible, while retaining the Asian resistance. But though they've made some progress, none of those trees have gained full resistance. The genetic engineering effort alone has gone on for more two decades, researchers at SUNY's College of Environmental Science and Forestry have been trying to build a better American chestnut, one that would be resistant to the blight. "At that point, genetic engineering of trees was really in its infancy," William Powell of the SUNY lab told me. "There were only one or two trees that had been what we call transformed -- had a gene put in." He and his colleague Charles Maynard had to begin before the beginning, figuring out first how to get new genes into their specimens' genomes, and then they could move on to seeing what manipulations might increase resistance. "I like to tell people we had to build the boat before we went fishing," Powell jokes. They, along with Scott Merkle at the University of Georgia (no relation to Hermann), began by trying to figure out how they could grow a tree from a single cell, since they would be putting the new genes into just one cell. For whatever reason, chestnuts were a tough nut to crack (no pun intended). "For example," Powell explained to me, "if you were to genetically engineer poplar, you can regenerate whole plants just from leaf tissue." With chestnuts, not so much. Instead, they had to harvest an immature nut, remove the embryo, put it in a special medium that allows it to replicate until they had multiple embryos. They worked for 16 years, developing the techniques that would enable them to actually begin genetic engineering. In 1997, one of the lab's graduate students attended a meeting of the American Society of Plant Biologists, and brought back a book containing hundreds of abstracts. "I was just looking through it," Powell recalled, "and I came across this abstract, the title of which was Expression of Oxalate Oxidase in Transgenic Plants Provides Resistance to Oxalic Acid and Oxalate-Producing Fungi." Now that may not sound like much if you don't spend all your days thinking about chestnut blight, but to Powell, it struck a bell in his brain -- oxalic acid is the toxin that chestnut blight produces. "Immediately I thought, well, here's a gene that we could use in the chestnut." That gene came from wheat. Powell reached out to one of the authors of that paper, Randy Allen at Texas Tech, who mailed him copies of the gene in a test tube. Back at the SUNY-ESF lab, they began by putting them into hybrid poplar (they still at that point were unable to genetically engineer chestnut). That worked, and they were able to increase the poplar's resistance to another fungal pathogen. "That kind of showed us, oh, this is a good gene to use," Powell said. Over the next few years, Powell, his colleagues at ESF, and scientists at labs around the country made incremental progress toward their dream of a blight-resistant transgenic chestnut. In the early 2000s, they were first able to genetically engineer a chestnut embryo; the related paper was published in 2006 -- the same year the first transgenic chestnut was planeted outside of the lab. Following that they developed a line of chestnuts called Darling 4, which seems to be a bit less resistant to the blight than Chinese chestnuts, but still much better than a regular American chestnut. Last summer, they planted one of those trees at the New York Botanical Garden, not far from where the blight was first discovered. But they wanted even higher levels of resistance yet, and now they think they might have done it: a transgenic line of chestnuts, more resistant to the blight than even the Chinese trees. The team, lead by then-graduate student Amelia Bo Zhang, published their results in Trangenic Research in March. 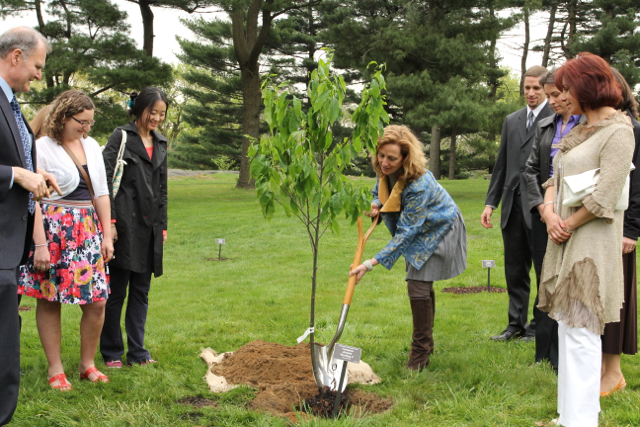 Earlier this month, they planted these trees at the Lafayette Road Experiment Station -- the first American chestnuts on this Earth that are highly resistant to the blight. "Doing research on trees is just very difficult," Zhang told me. "The trees have very long lifespans. And it took a lot of researchers so many years to get to the point where we are today." Powell estimates that more than 50 different people at his and Maynard's lab have worked on this project over the last 23 years. Powell is quick to emphasize that these results are preliminary, based on "leaf assay tests" which take place in the lab and are performed on small plants. "Working with trees is really hard because you have to get it to grow to a certain size. We really need to get it to be about two to three years old to do the final test to confirm that it is truly resistant," he said. So for now, those little saplings just need to grow. As they do, the lab's going to keep at work, hunting for more genes that could provide resistance to the fungus, in the hopes that they can eventually design plants with a more lasting resistance, one that the fungus cannot mutate to overcome. In the long run, Powell would like to see resistant transgenic trees crossbred with the few surviving wild trees, in the hopes of building up a diverse population of trees, all carrying the wheat gene. With those trees, he'd like to begin a restoration program, planting the trees in former mines (where the soil is unnaturally acidic) and passing the trees out to the general public for reintroduction to the eastern forests, once the trees get the necessary approval from the USDA, the EPA, and, since chestnuts provide food, the FDA. The chestnut isn't the first transgenic tree to go through a regulatory process -- transgenic plums and papaya have both been approved for agriculture -- but, when it comes to reintroducing a genetically engineered tree into the wild, Powell says the chestnut program is "unique." All of which is to say, we may soon find ourselves in the position of being able to engineer, through genetic manipulation, an ecosystem more healthy and diverse than it would be if we just left it alone; with 21st-century biotechnology, we could recreate something more like the forests of old. What are the risks we would undertake in doing so? Will our careful regulatory process protect us from upsetting our forests once again? When Robert Frost asked, in 1936, "Will the blight end the chestnut?" he thought the answer no. The trees would keep "smouldering at the roots / And sending up new shoots / Till another parasite / Shall come and end the blight." Natural processes would send the system back into balance. The poem is called "Evil Tendencies Cancel." But of course, that hasn't been the case. The eastern forests have returned, thrived even, in recent decades, but they've done so without the iconic chestnut. In the end, if Amelia Bo Zhang's trees do as well as she and Powell hope, it will be the hand of science, not a newfound parasite, that will right the fallen.